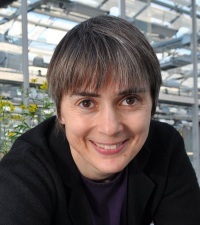 Ottoline Leyser is Professor of Plant Development and Director of the Sainsbury Laboratory at the University of Cambridge. Her research is focused on the role of plant hormones in allowing plants to adapt their growth and development to suit the environment in which they are growing. She is particularly interested in how hormones that move between the root and shoot allow plants to change their shoot branching patterns in response to nutrient availability.